SICK Automation - one of the world’s leading producers of sensors and sensor solutions for industrial applications, with headquarters in Waldkirch im Breisgau near Freiburg - recently supplied two turnkey track and trace systems for multinational tyre manufacturers Bridgestone and Sumitomo Rubber at their South African plants. 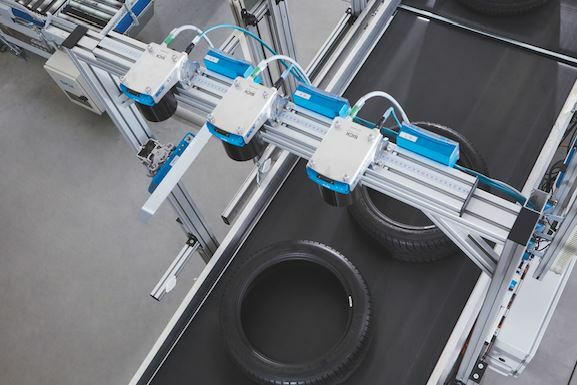 This marks the first installations worldwide of the sensor specialist’s latest image-based code readers, the Tire Lector Array (TLA), in the tyre manufacturing industry. By tracking and tracing barcoded tyres across the manufacturing and internal handling cycle, the TLA is described as playing a critical role in managing and controlling the ‘just in time’ production processes of the plants, as well as automated batch and distribution management. 10 systems were supplied to the Bridgestone plant in Pretoria in 2016, while the Sumitomo Rubber plant in Ladysmith has a total of four systems. Both plants manufacture the full range of standard and low-profile tyres for on-road vehicles, from 13 to 20 inch. “In each case, SICK Automation worked closely with the manufacturers in designing and supplying the systems,” Chain continues. Each TLA consists of three Lector65x sensors, positioned both above and below the conveyor. The modular structure housing the sensors is easily customised according to any customer width and height requirement.